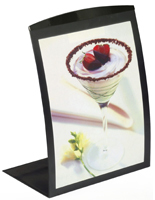 This Picture Frame is Available in Black Aluminum and Incorporates Magnetic Technology! This Picture Frame is Great for Any Countertop or Tabletop! Poster Frames Sold Here! Thousands In Stock, Purchase Online! 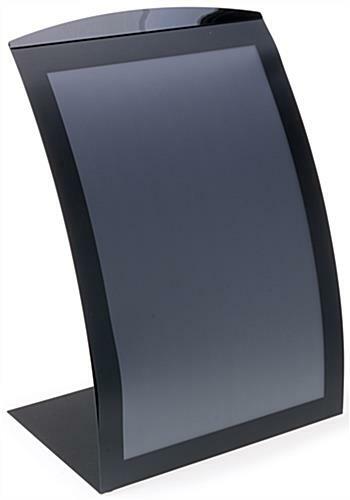 Picture Frame in Black with Magnet Details, 11" x 17"
This picture frame incorporates a magnetic border, permitting you to make fast and easy poster changes. To interchange your images, merely lift up the magnetic, non-glare lens and slide your images underneath. The magnetic flick lens will hold the media securely in place. 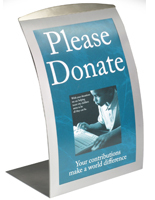 We supply the poster holder with a non-glare lens to shelter your images from being damaged, and likewise preventing reflection from hindering your subject matter. 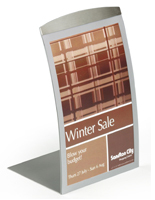 This curved poster holder is an perfect method to attract attention to your artwork. This picture frame is an perfect countertop marketing tool. Featuring a stylish curved design, this picture frame, also recognized as a sign display, attracts attention from all angles. 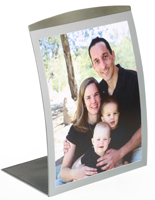 This picture frame is made of rugged, powder-coated aluminum, with a black finish to effortlessly match with any decor. 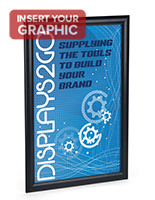 This sign display, picture frame is engineered to accommodate 11"w x 17"h images. 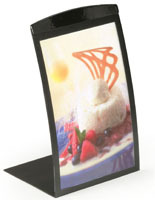 With its contemporary design, this picture frame can be utilized to exhibit notices, media content, pictures and menus. It is perfect in retail stores, banks, or even restaurants! 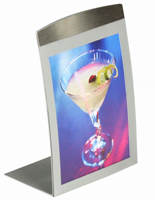 Additionally, we offer the curved picture frame in a silver finish as well.